I received compensation from Dr. Scholl’s® to write this post. All opinions are entirely my own. I’m so excited that 2018 New York Fashion Week is almost here! #advertisement I love New York Fashion Week more than anything and I’ll be walking around one of my favorite cities every day (and night) for the entire week. I’ll also be attending amazing shows, going to some fabulous parties and visiting incredible show rooms and yes, I’ll share on my social media! So while I want to be super stylish, I also need to be comfortable and able to smile as The Bubbly Blonde from morning until night. There is nothing worse than hobbling around in shoes that are making your feet ache when it’s only 11:00am! Fashion Week days are long and can be brutal on your feet. So here’s my secret comfort weapon. I use Dr. Scholl’s Stylish Step™ High Heel Relief Insoles and Extended Comfort Insoles for Flats. These insoles really provide all-day comfort. For those of you who are true Shoe Fashionistas, you understand this means I can now wear my most stylish heels or flats longer with ease and comfort! So, before leaving for NYC, I will head to my local Target and stock up on many of my travel needs. First on the list will be some Dr. Scholl’s Stylish Step™ Insoles. These are easily found in the Dr. Scholl’s section by the footcare aisle, near the pharmacy. Having these incredible products packed in my suitcase, I’m confident that I no longer have to sacrifice my comfort for glamour. Dr. Scholl’s Stylish Step™ High Heel Relief Insoles are great because they actually give all day comfort *check! Their ultra-soft gel arch actually takes the pressure off the ball of your foot *check! The insoles help to relieve the pain caused from high heels *check *check! So, yes, I will be wearing these insoles next week while striding around New York City! The best part is there will be no more hobbling and grimacing for this Bubbly Blonde who’s trying to be fashionable! 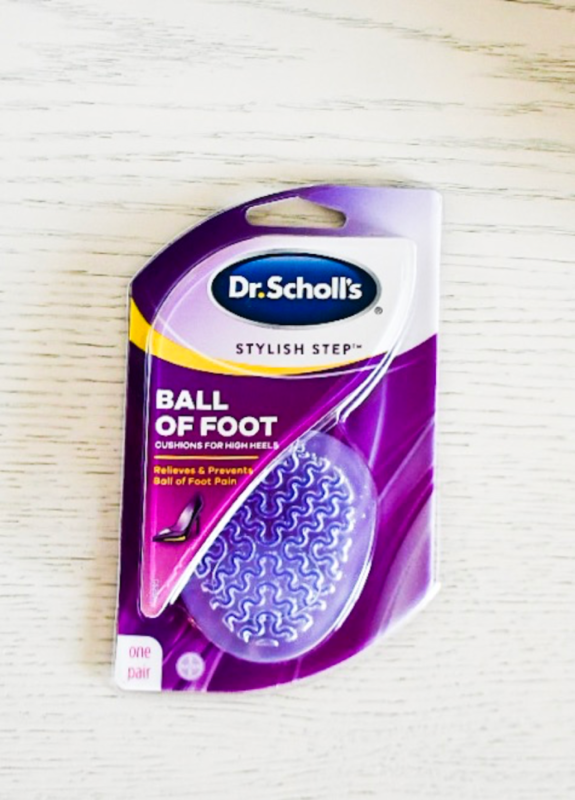 If you don’t want full length insoles, a great item to consider from Dr. Scholl’s Stylish Step™ line is the Ball of Foot Cushions for High Heels. These smaller cushions pinpoint high heel foot pain and relieve the ball of foot pain caused by high heels. These insoles also provide cushioning, absorb shock for all day comfort and prevent your toes from scrunching, while also keeping your feet from sliding forward. Great item! I’m so happy to share some of my best fashion secrets with you and believe that if you try these amazing products, you will love your high heels or flats like never before! When you see my posts about New York Fashion Week, you’ll know the amazing little beauty secret tucked inside my shoes! Right now you can also save here and starting 9/9, you can also head here to BOGO 25% off!